"Great gosh! My husband! Then who the devil's this?" 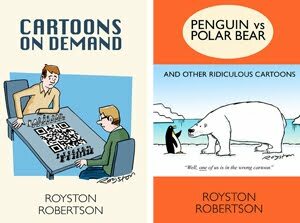 Yes, unlikely though it sounds, it appears there was once another cartoonist called Royston. And with a signature eerily close to mine! These were emailed to me be Denise Miles, from Sydney, Australia (click to enlarge). 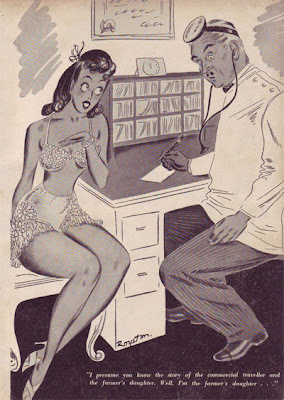 Denise found them in the 1941 annual for Man magazine, a saucy periodical published by Land newspapers in Australia. "I presume you know the story of the commercial traveller and the farmer's daughter. Well I'm the farmer's daughter ..."
If you know anything about this Royston (the name is more common as a surname, so that may be the case here) let me know in the comments section below, or send me an email. My theory is that in the future I invent a time machine, go back to the 1940s and illicitly sign a bunch of contemporary cartoons, before sending them off to magazines which I hope won't notice. Hopefully, someone else will be able to provide more plausible information. Look at the similarity of the signature to mine though. I'm officially freaked out. 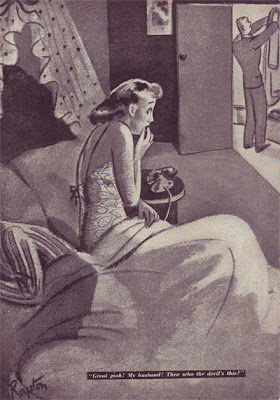 Denise tells me that the Man annual has a cover price of two shillings and contains many cartoons by Royston, alongside some beautiful old advertisements for Australian companies, an ad for war savings certificates and another telling its wartime readership to "Speak no rumour, hear no rumour". Other cartoons in the book are signed "Such", "Barnes Amos" and, possibly, "Gibson". There are also cartoons by someone whose signature is a flower. v different drawing style though. keep working on that machine, wallace! 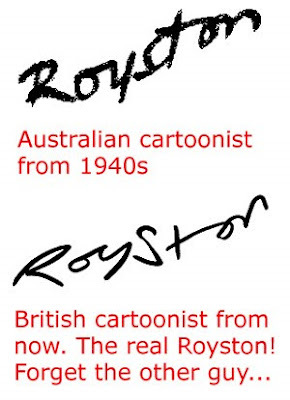 That signature is uncannily close to yours, Royston. I'm amazed. Yeah, there are some differences, most noticeably the "R", and the "s" does not stand alone, as in mine. But the "oy" is done as a single stroke in the same way, as is the cross of the "t" with the "on". I think you should have a crack at a tribute to the old Royston. Is that the "weeping angels" episode? A classic. Totally freaked out child number one that one! Hah. Quite freaky! I await the movie: 'The Time Travelling Cartoonists Wife' with Eric Bana playing you. I see Simon Pegg with a wig and specs. He won't need the wig, the way things are going. Royyston can I borrow that time machine when You have finished with it please? OK. As long as I don't like the 1940s so much I want to stay there.